The average temperature in Central Java is between 18–28 degrees Celsius and the relative humidity varies between 73–94 percent. While a high level of humidity exists in most low-lying parts of the province, it drops significantly in the upper mountains. The highest average annual rainfall of 3,990 mm with 195 rainy days was recorded in Salatiga. The geography of Central Java is regular with small strips of lowlands near the northern and southern coast with mountain ranges in the centre of the region. 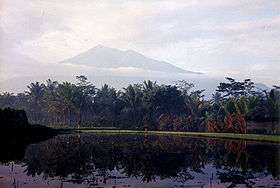 To the west lies an active stratovolcano Mount Slamet, and further east is the Dieng Volcanic Complex on Dieng Plateau. Southeast of Dieng lies the Kedu Plain, which is bordered to the east side by the twin volcanoes of Mount Merapi and Mount Merbabu. South of Semarang, lies Mount Ungaran, and to the north-east of the city lies Mount Muria on the most northern tip of Java. To the east near the border with East Java lies Mount Lawu, where its eastern slopes are in the East Java province. On the eve of the World War II in 1942, Central Java was subdivided into 7 residencies (Dutch residentie or plural residenties, Javanese karésiḍènan or karésidhènan) which corresponded more or less with the main regions of this area. These residencies were Banjoemas, Kedoe, Pekalongan, Semarang, and Djapara-Rembang plus the so-called Gouvernement Soerakarta and Gouvernement Jogjakarta. However, after the local elections in 1957 the role of these residencies were reduced until they finally disappeared. Nowadays Central Java (excluding Yogyakarta Special Region) is divided into 29 regencies (kabupaten) and 6 cities (kota, previously kotamadya and kota pradja), the latter being independent of any regency. These contemporary regencies and cities can further be subdivided into 565 districts (kecamatan). These districts are further subdivided into 7,804 rural communes or "villages" (desa) and 764 urban communes (kelurahan). Java has been inhabited by humans or their ancestors (hominina) since prehistoric times. In Central Java and the adjacent territories in East Java remains known as "Java Man" were discovered in the 1890s by the Dutch anatomist and geologist Eugène Dubois. Java Man belongs to the species Homo erectus. They are believed to be about 1.7 million years old. Then about 40,000 years ago, Australoid peoples related to modern Australian Aboriginals and Melanesians colonised Central Java. They were assimilated or replaced by Mongoloid Austronesians by about 3000 BC, who brought with them technologies of pottery, outrigger canoes, the bow and arrow, and introduced domesticated pigs, fowls, and dogs. They also introduced cultivated rice and millet. Recorded history began in Central Java in the 7th century AD. The writing, as well as Hinduism and Buddhism, were brought to Central Java by Indians from South Asia. Central Java was a centre of power in Java back then. In 664 AD, the Chinese monk Hui-neng visited the Javanese port city he called Hēlíng (訶陵) or Ho-ling, where he translated various Buddhist scriptures into Chinese with the assistance of the Javanese Buddhist monk Jñānabhadra. It is not precisely known what is meant by the name Hēlíng. It used to be considered the Chinese transcription of Kalinga but it now most commonly thought of as a rendering of the name Areng. Hēlíng is believed to be located somewhere between Semarang and Jepara. The ninth-century Buddhist monument Borobudur built by the Sailendra. The first dated inscription in Central Java is the Inscription of Canggal which is from 732 AD (or 654 Saka). This inscription which hailed from Kedu, is written in Sanskrit in Pallava script. In this inscription it is written that a Shaivite king named Sri Sanjaya established a kingdom called Mataram. Under the reign of Sanjaya's dynasty several monuments such as the Prambanan temple complex were built. In the meantime a competing dynasty arose, which adhered to Buddhism. This was the Sailendra dynasty, also from Kedu, which built the Borobudur temple. After 820 there is no more mention of Hēlíng in Chinese records. This fact coincides with the overthrow of the Sailendras by the Sanjayas who restored Shaivism as the dominant religion. Then in the middle of the 10th century, for unknown reason, the centre of power moved to Eastern Java. A few centuries later, after the destruction of the great Hindu Majapahit Empire in the 15th - 16th centuries by the Central Javanese Muslim kingdom of Demak, the Javanese centre of power moved back to Central Java. In the meanwhile European traders began to frequent Central Javanese ports. The Dutch established a presence in the region through their East India Company. After Demak itself collapsed, a new kingdom on the Kedu Plain emerged. This new kingdom, which was also a sultanate, bore the old name of Mataram. Under the reign of Sultan Agung, Mataram was able to conquer almost all of Java and beyond by the 17th century, but internal disputes and Dutch intrigues forced Mataram to cede more and more land to the Dutch. These cessions finally led to several partitions of Mataram. The first partition was after the 1755 Treaty of Giyanti. This treaty divided the old kingdom in two, the Sultanate of Surakarta and the Sultanate of Yogyakarta. Then few years later Surakarta was divided again with the establishment of the Mangkunegaran after the Treaty of Salatiga (March 17, 1757). During the Napoleonic Wars in Europe, Central Java, as part of the Netherlands East-Indies, a Dutch colony, was handed over to the British. In 1813, the Sultanate of Yogyakarta was also divided with the establishment of the Pakualamanan. The shattered kingdom, Mataram in 1830, after the Java War. After the British left, the Dutch came back, as decided by the Congress of Vienna. Between 1825 - 1830 the Java War ravaged Central Java. The result of the war was a consolidation of the Dutch power. The power and the territories of the divided kingdom of Mataram were greatly reduced. However Dutch rule brought modernization to Central Java. 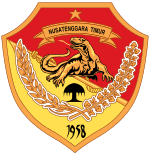 In the 1900s the modern province of Central Java, the predecessor of the current one was created. It consisted of five regions or gewesten in Dutch. 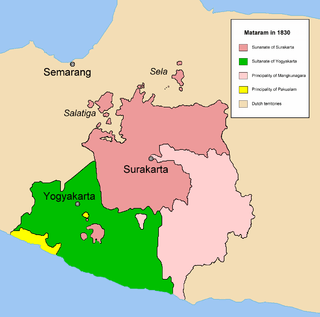 Surakarta and Yogyakarta were autonomous regions called Vorstenlanden (literally "princely states"). Then after the Indonesian independence the province of Central Java was formalized on August 15, 1950, excluding Yogyakarta but including Surakarta. Since then there have been no (major) changes in the administrative division of Central Java. In 1998, preluding the downfall of president Suharto, anti Chinese violence broke out in Surakarta (Solo) and surrounding areas. Much Chinese property and other buildings were burnt down. 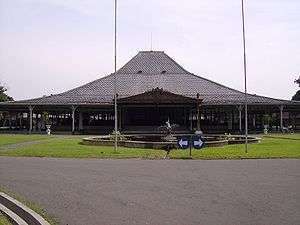 In 1999, public buildings in Surakarta were burnt again by supporters of Megawati Soekarnoputri after the Indonesia parliament chose Abdurrahman Wahid instead of Soekarnoputri to be President of Indonesia. They carried out 'sweeping actions' against Western foreigners who reside in this city after the September 11, 2001 attacks. The 2006 Yogyakarta earthquake in the south and Yogyakarta devastated many buildings and caused thousands of deaths and more than 37,000 injuries. Today, some areas are still under reconstruction. As of the 2010 census, Central Java's population stood at some 32,380,687. As of the 1990 census, the population was 28,516,786. So the population has increased approximately 13.5% in 20 years. The three biggest regencies in terms of population are: Brebes, Banyumas and Cilacap. Together these regencies make up approximately 16% of the Central Javanese population. Major urban population centres are Greater Semarang, Greater Surakarta and the Brebes-Tegal-Slawi area in the north-west of the province. Although the overwhelming majority of Javanese are Muslims, many of them also profess indigenous Javanese beliefs. Clifford Geertz, in his book about the religion of Java made a distinction between the so-called santri Javanese and abangan Javanese. He considered santri Javanese as orthodox Muslims while abangan Javanese are nominal Muslims that devote more energy to indigenous traditions. Dutch Protestants were active in missionary activities and were rather successful. The Dutch Catholic Jesuit missionary man, F.G.C. van Lith also achieved some success, especially in areas around the central-southern parts of Central Java and Yogyakarta in the beginning of the 20th century, and he is buried at the Jesuit necropolis at Muntilan. After the Overthrow of Sukarno in 1965, religious identification of citizens became compulsory. Therefore, there has been a renaissance of Buddhism and Hinduism since then. As one has to choose a religion out of the five official religions in Indonesia; i.e. Islam, Protestantism, Catholicism, Hinduism, and Buddhism, the latter two became alternatives for people who didn't want to be Muslims or Christians. Confucianism is also common amongst Chinese Indonesians. Since 2006 it is a recognised official religion. The vast majority of the population in Central Java are ethnic Javanese, they constitute approximately 98% of the whole population. In addition to the Javanese, small pockets of Sundanese communities are to be found near the border with West Java, especially in Brebes and Cilacap regencies. Sundanese toponyms are common in these regions such as Dayeuhluhur in Cilacap, Ciputih and Citimbang in Brebes and even Cilongok as far away in Banyumas. In urban centers, other minorities such as Chinese Indonesians and Arabs are common. The Chinese are even to be found in rural areas. The urban areas that are densely populated by Chinese Indonesian, are called pecinan, which means "China Town". As the overwhelming majority of the population of Central Java are Javanese, the most dominant language is Javanese. There are several dialects which are spoken in Central Java, the two main dialects are western Javanese (also called Basa Ngapak which includes the "Banyumasan dialect" and the dialect of Brebes-Tegal-Pekalongan) and central Javanese. In urban centers Indonesian is widely spoken. Central Java is considered to be the heart of the Javanese culture. Home of the Javanese courts, Central Javanese culture formed what non-Javanese see as the "Javanese Culture" along with it stereotypes. The ideal conducts and morals of the courts (such as politeness, nobility and grace) influence the people tremendously. The people of Central Java are known as soft-spoken, very polite, extremely class-conscious, apathetic, down-to-earth, et cetera. These stereotypes formed what most non-Javanese see as "Javanese Culture", when in fact not all of the Javanese people behave that way. Moreover, most Javanese are far from the court culture. The Javanese cultural area can be divided into three distinct main regions: Western Javanese, Central Javanese and Eastern Javanese culture or in their Javanese names as Ngapak, Kejawèn and Arèk. The boundaries of these cultural regions coincide with the isoglosses of the Javanese dialects. Cultural areas west of Dieng Plateau and Pekalongan Regency are considered Ngapak whereas the boundary of the eastern cultural areas or Arèk lies in East Java. Consequently, culturally, Central Java consists of two cultures, while the Central Javanese Culture proper is not entirely confined to Central Java. The architecture of Central Java is characterised by the juxtaposition of the old and the new and a wide variety of architectural styles, the legacy of many successive influences by the Indians, the Persians and the Arabs, the Chinese, and the Europeans. In particular, northern coastal cities such as Semarang, Tegal and Pekalongan can boast fine colonial European architecture. The European and Chinese influence can be seen in Semarang's temple of Sam Poo Kong dedicated to Zheng He and the Domed Church built in 1753. The latter is the second oldest church in Java and the oldest in Central Java. Inland Surakarta, as a former capital, also has some fine European architecture. Famous for its religious heritage, Central Java has some notable religious buildings. The Borobudur and the Prambanan temple complexes are among the largest Buddhist and Hindu structures in the world. In general, a characteristic Javanese mosque doesn't have a dome as its roof but a Meru-like roof instead, which is reminiscent of a Hindu or Buddhist temple. The tower of the famous Mosque of Kudus resembles a Hindu-Javanese or Balinese temple more than a traditional Middle-Eastern mosque. Central Java is famous and well known for its exquisite batik, a generic wax-resist dyeing technique used on textiles. There are different styles of batik motifs. A centre of batik production is Pekalongan. Other centres are Surakarta and Yogyakarta. Batik in Pekalongan style which represent gaya pesisir (or coastal style) is different from the one in Surakarta and Yogyakarta, which represent batik from the heartland of Java (gaya kejawèn). You can even see the court influences in the art forms. The dances of the courts of Java are usually slow and graceful, with no excessive gestures. The people followed this approach, and as a result, slow-paced and graceful movements can even be found in folk dances throughout Central Java (with some exceptions). You can enjoy the beauty of Central Javanese dances in "Kamajaya-Kamaratih" or "Karonsih", usually performed in a traditional Javanese wedding. There are several kinds of Central Javanese theater and performing arts. The most well known is of course the Javanese wayang theater. There are several kinds of Central Javanese wayang, amongst others: wayang kulit, wayang klitik, wayang bèbèr, wayang golèk, and wayang wong. Wayang kulit are shadow puppets theater with leather puppets. The stories are loosely based on Mahabharata and Ramayana cycles. Wayang klitik are puppets theater with flat wooden puppets. The stories are based on Panji (king) stories. Panji was a native Javanese princes who set of in a 'journeys of desire'. Wayang bèbèr is scroll theater, and it involves "performing" scenes of a story elaborately drawn and painted on rolled sheets. Wayang golèk consists of three-dimensional wooden puppets. The narrative can be based on anything, but usually the stories are drawn from Islamic heroic narratives. Finally wayang wong is wayang theater involving live figures; actors who are performing a play. The narrative however must be based on Mahabharata or Ramayana. In addition to wayang, there is another form of theater which is called ketoprak. Ketoprak is a staged play by actors accompanied with Javanese gamelan. The narrative is free but cannot be based on Mahabharata or Ramayana. Otherwise it will be some kind of wayang wong. Central Javanese music is almost synonymous with gamelan. This is a musical ensemble typically featuring a variety of instruments such as metallophones, xylophones, drums, and gongs; bamboo flutes, bowed and plucked strings, and vocalists may also be included. The term refers more to the set of instruments than the players of those instruments. A gamelan as a set of instruments is a distinct entity, built and tuned to stay together — instruments from different gamelan are not interchangeable. However, gamelan is not typically Central Javanese as it is also known somewhere else. Contemporary Javanese pop music is called campursari. It is a fusion between gamelan and Western instruments, much like kroncong. Usually the lyrics are in Javanese, but not always. One notable singer is Didi Kempot, born in Sragen, north of Surakarta. Didi Kempot mostly sings in Javanese. It can be argued that Javanese literature started in Central Java. The oldest known literary work in the Javanese language is the Inscription of Sivagrha from Kedu Plain. This inscription which is from 856 AD, is written as a kakawin or Javanese poetry with Indian metres. Then the oldest of narrative poems, Kakawin Ramayana, which tells the well-known story of Ramayana is believed to have come from Central Java. It can be safely assumed that this kakawin must have been written in Central Java in the 9th century. After the shift of Javanese power to East Java, it had been quiet from Central Java for several centuries, concerning Javanese literature until the 16th century. At this time the centre of power was shifted back to Central Java. The oldest work written in Modern Javanese language concerning Islam is the so-called "Book of Bonang" or also "The Admonitions of Seh Bari". This work is extant in just one manuscript, now kept in the University Library in Leiden, The Netherlands as codex Orientalis 1928. It is assumed that this manuscript originates from Tuban, in East Java and was taken to the Netherlands after 1598. However this work is attributed to Sunan Bonang, one of the nine Javanese saints who spread Islam in Java (Wali Songo) and Sunan Bonang came from Bonang, a place in Demak Regency, Central Java. So it can be argued that this work also mark the beginning of Islamic literature in Central Java. However the pinnacle of Central Javanese literature was created at the courts of the kings of Mataram in Kartasura and later in Surakarta and Yogyakarta, mostly attributed to the Yasadipura family. The most famous member of this family is Rangga Warsita who lived in the 19th century. He is the best known of all Javanese writers and also one of the most prolific. He is also known as bujangga panutup or "the last court poet". After the Indonesian independence, the Javanese language as a medium was pushed to the background. Still one of the greatest contemporary Indonesian author, Pramoedya Ananta Toer was born in 1925 in Blora, Central Java. He was an Indonesian author of novels, short stories, essays, polemics, and histories of his homeland and its people. A well-regarded writer in the West, Pramoedya's outspoken and often politically charged writings faced censorship in his native land during the pre-reformation era. For opposing the policies of both founding president Soekarno, as well as those of its successor, the New Order regime of Soeharto, he faced extrajudicial punishment. During the many years in which he suffered imprisonment and house arrest, he became a cause célèbre for advocates of freedom of expression and human rights. In his works he writes much about life and social problems in Java. Rice is the staple food of Central Java. In addition to rice, dried cassava known locally as gaplèk also serve as staple food. Javanese food tends to taste sweet. Cooked and stewed vegetables, usually in coconut milk (santen in Javanese) are popular. Raw vegetable which is popular in West Java is less popular in Central Java. Saltwater fish, both fresh and dried is common, especially among coastal populations. Freshwater fish is not popular in Central Java, unlike in West Java, except perhaps for catfish known locally as lélé. Catfish is usually fried and served with chilli condiment (sambal) and raw vegetables. Chicken, mutton and beef are common meat. Dog meat, known by its euphemism daging jamu (literally "traditional medicine meat") is also occasionally eaten by certain parts of the population. Tofu and tempe serve as common fish and meat replacement. Famous Central Javanese dishes include gudeg (sweet stew of jackfruit) and Sayur Lodeh (vegetables cooked in coconut milk). Besides the aforementioned tofu, there is strong Chinese influence in many dishes. Some examples of Sino-Javanese food are noodles, bakso (meatballs), lumpia, soto (some kind of soup made with chicken or beef) et cetera. The widespread use of sweet soybeans sauce (kecap manis) in the Javanese cuisine can also be attributed to Chinese influence. Central Java is connected to the interprovincial national way on the northern coast (Jalur Pantai Utara or Jalur Pantura) which runs from Anyer in Banten to Banyuwangi, East Java on the opposite of Bali. Losari, the Central Javanese gate at the western border on the northern coast, could be reached from Jakarta in 4 hours drive. On the southern coast, there is also a national way which run from Kroya at the Sundanese-Javanese border, through Yogyakarta to Surakarta and then to Surabaya via Kertosono in East Java. There is furthermore a direct connection from Tegal to Purwokerto and from Semarang to Yogyakarta and Surakarta. In addition to that there is a toll road in Semarang and from Semarang to Ungaran which runs for 14 kilometer. Trans-Java Toll Road also would serves Central Java with highway. Some parts has been opened and the others are under construction. Central Java was the province that first introduced a railway line in Indonesia. The very first line began in 1873 between Semarang and Yogyakarta by a private company, but this route is now no longer used. Today there are five lines in Central Java: the northern line which runs from Jakarta via Semarang to Surabaya. Then there is the southern line from Kroya through Yogyakarta and Surakarta to Surabaya. There is also a train service between Semarang and Surakarta and a service between Kroya and Cirebon. At last there is a route between Surakarta and Wonogiri. All of these lines are single track lines, except the line between Yogyakarta and Surakarta which is double track. On the northern coast Central Java is served by 8 harbours. The main port is Tanjung Mas in Semarang, other harbours are located in Brebes, Tegal, Pekalongan, Batang, Jepara, Juwana and Rembang. The southern coast is mainly served by the port Tanjung Intan in Cilacap. Finally on mainland Central Java there are three commercial airports. There is one additional commercial airport on the Karimunjawa isles. The airports on the mainland are: Adisumarmo International Airport in Surakarta, Achmad Yani Airport in Semarang and Tunggul Wulung Airport in Cilacap. Karimunjawa is served by Dewadaru Airport. GDP in the province of Central Java was estimated to be around $US 98 billion in 2010, with a per capita income of around $US 3,300. Economic growth in the province is quite rapid and GDP is forecast to reach $US 180 billion by 2015. Much of Central Java is a fertile agricultural region. The primary food crop is wet rice. An elaborate irrigation network of canals, dams, aqueducts, and reservoirs has greatly contributed to Central Java's the rice-growing capacity over the centuries. In 2001, productivity of rice was 5,022 kilograms/ha, mostly provided from irrigated paddy field (± 98%). Klaten Regency had the highest productivity with 5525 kilograms/ha. Other crops, also mostly grown in lowland areas on small peasant landholdings, are corn (maize), cassava, peanuts (groundnuts), soybeans, and sweet potatoes. Terraced hillslopes and irrigated paddy fields are familiar features of the landscape. Kapok, sesame, vegetables, bananas, mangoes, durian fruits, citrus fruits, and vegetable oils are produced for local consumption. Tea, coffee, tobacco, rubber, sugarcane and kapok; and coconuts are exported. Several of these cash crops at a time are usually grown on large family estates. Livestock, especially water buffalo, is raised primarily for use as draft animals. Salted and dried fish are imported. 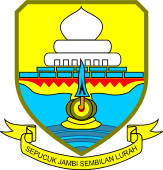 Central Java is home to such notable state universities, as Diponegoro University, Semarang State University, and Walisongo Islamic University (Universitas Islam Negeri Walisongo) in Semarang; Sebelas Maret State University in Surakarta; and Jenderal Soedirman University in Purwokerto. The Military Academy (Akademi Militer) is located in Magelang Regency while the Police Academy (Akademi Kepolisian) is located in Semarang. Furthermore, in Surakarta the Surakarta Institute of Indonesian Arts (ISI Surakarta) is located. In addition to these, Central Java has hundreds of other private higher educations, including religious institutions. For foreign students requiring language training Salatiga has been a location for generations of students attending courses. Candi Prambanan at the border of Klaten regency and Yogyakarta is the biggest complex of Hindu temples. It is also a UNESCO World Cultural Heritage Site. In the region around the Dieng Plateau, one could find several temples. These are built before the era of the ancient Mataram. Two interesting palaces, the Palace of the Sunan (Keraton Kasunanan) and Pura Mangkunegaran, are located in Surakarta, which is considered one of the centers of Javanese culture. The Grojogan Sewu waterfall is located in Karanganyar Regency, which has a beautiful scenery. Several Majapahit temples and Sangiran museum are also located in Central Java. 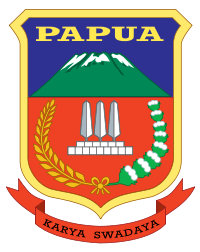 The motto of Central Java is Prasetya Ulah Sakti Bhakti Praja. This is a Javanese phrase meaning "A vow of devotion with all might to the country". 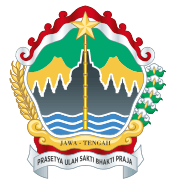 The coat of arms of Central Java depicts a legendary flask, Kundi Amerta or Cupu Manik, formed in a pentagon representing Pancasila. In the center of the emblem stands a sharp bamboo spike (representing the fight for independence, and it has 8 sections which represent Indonesia's month of Independence) with a golden five-pointed star (representing faith in God), superimposed on the black profile of a candi (temple) with seven stupas, while the middle stupa is the biggest. This candi is reminiscent of the Borobudur. Under the candi wavy outlines of waters are visible. Behind the candi two golden mountain tops are visible. These twin mountains represents the unity between the people and their government. The emblem shows a green sky above the candi. 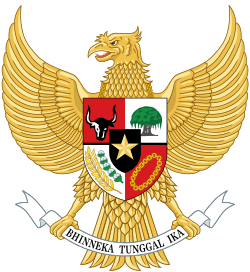 Above, the shield is adorned with a red and white ribbon, the colours of the Indonesian flag. Lining the left and right sides of the shield are respectively stalk of rice (17 of them, representing Indonesia's day of Independence) and cotton flowers (5 of them, each one is 4-petaled, representing Indonesia's year of Independence). At the bottom, the shield is adorned with a golden red ribbon. On the ribbon the name "Central Java" (Jawa Tengah) is inscribed in black. The floral symbol of the province is the Michelia alba, while the provincial fauna is Oriolus chinensis. Dalton. B. (1980's) Indonesia Handbook various editions - Central Java. 1 2 3 4 5 Archived June 29, 2006, at the Wayback Machine. ↑ "Java man (extinct hominid) - Encyclopedia Britannica". Britannica.com. Retrieved 2013-12-10. ↑ Archived April 10, 2007, at the Wayback Machine. ↑ W. J. van der Meulen (1977). "In Search of "Ho-Ling"" (– Scholar search). Indonesia. 23: 87–112. doi:10.2307/3350886. ↑ Robert Cribb, Historical Atlas of Indonesia (2000:170-171). ↑ Archived June 19, 2006, at the Wayback Machine. 1 2 Archived March 5, 2007, at the Wayback Machine. ↑ "Encyclopedia Britannica". Britannica.com. Retrieved 2013-12-10. Wikimedia Commons has media related to Central Java.